Boeing said it is working with regulators to get the necessary US government approvals. If the deal is approved it will be the largest between a US business and Iran since the 1979 revolution. "Boeing will continue to follow the lead of the US government with regards to working with Iran's airlines, and any and all contracts with Iran's airlines will be contingent upon US government approval," Boeing said in a statement. 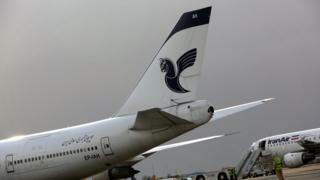 Iran Air confirmed that the deal would be for Boeing 737 and 777 aircraft. The country's civil aviation authority is attempting to modernise its fleet by adding between 400 and 500 aircraft over the next 10 years. Airports and other aviation infrastructure also needing modernising. The Boeing deal is not set in stone, however. Several US congress members have voiced their opposition to the transaction. President Obama's decision to lift sanctions remains controversial. A deal between European aerospace firm Airbus and Iran Air - announced in January - is still waiting for approval from regulators in the US where some of Airbus' parts are made. If the Boeing deal is approved there is a question mark of how Iran Air will pay for the aircraft. US banks are still barred from working with Iran.